Alfalfa seeds for sprouting. High germination rate and easy to grow and sprout. Alfalfa sprouts the cornerstone of sprouting and are rich in vitamins, amino acids, minerals and protein. Resealable packaging, small quantity to bulk.Certified Organic. 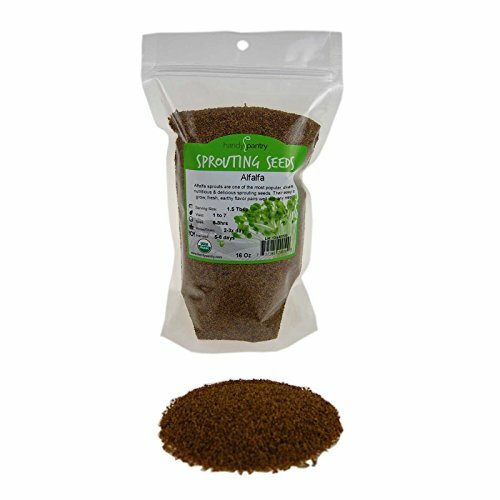 Organic alfalfa seeds are a staple for sprouting. They are fun, fast, easy growers and are delicious and nutritious. They yield approximately 7 times the weight of seed in sprouts, so a pound of alfalfa sprout seeds will produce over seven pounds of delicious sprouts.